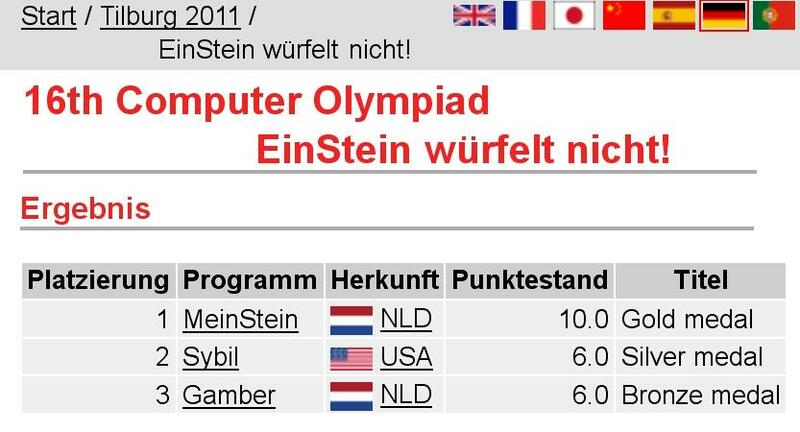 In November 2011 the Computer Olympiad took place in the nice Dutch town Tilburg. This time, also "EinStein würfelt nicht" was played in the event. Six teams competed, two each from the Netherlands, the U.S., and Germany. A very special participant was the program "MeinStein", written by Theo van der Storm. Theo passed away in 2009. 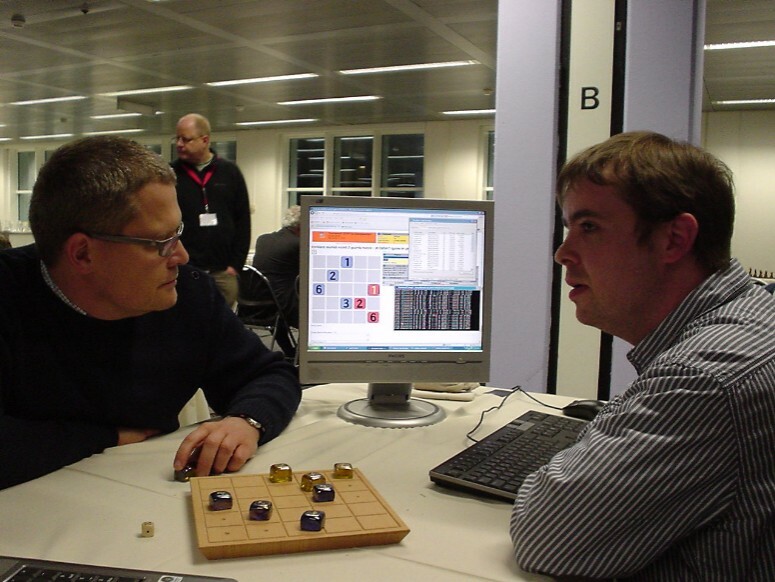 But the bot was allowed to play, operated by Theo's friend Jan Krabbenbos. A report on the tournament was written by Wesley Turner. It can be found in the June 2012 issue of the ICGA Journal. Here are some pictures from the event. Grace and Jan Krabbenbos took the gold medal for Theo's MeinStein, silver medalist Wesley Turner on the right. Bronze medalist Richard Pijl and Wesley Turner in Ro-Sham-Bo mode to determine who gets the first move in their match. To the left, Richard's beautiful daughter. A shot from the middle of the battle: Richard Pijl and Wesley Turner fully concentrated. Behind them another beautiful daughter of Richard. 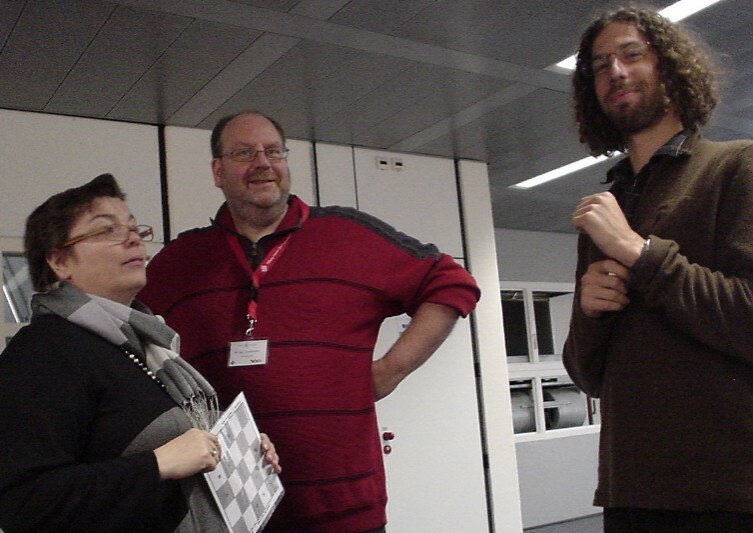 Chess programmer Stefan Meyer-Kahlen (on the left) chatting with Johannes Zwanzger, who competed both in chess and in EinStein with his bots. The official ICGA table with the medalists of the EinStein tournament.